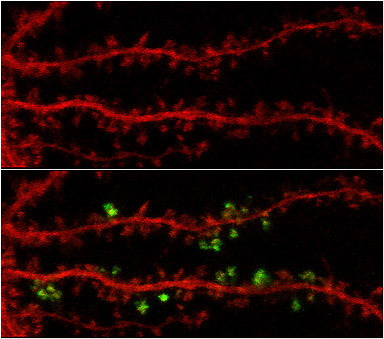 A neuron expressing red fluorescent protein (mCherry) and photoactivatable green fluorescent protein (PA-GFP) is shown. Before (top) and after (below) photoactivation of PA-GFP images show that proteins could be photoactivated in a spatially- selective fashion. A single neuronal synapse is thought to comprise hundreds of distinct proteins. The goal of Dr. Morgan Sheng’s lab is to identify and understand these proteins, particularly those critical to memory formation. The lab’s progress in decoding the synaptic architecture may lead to a deeper understanding of how synaptic connections may go wrong in disorders such as Alzheimer’s, schizophrenia, and autism. Photoactivatable GFP converts from a dark state to fluorescent state upon exposure to light at a wavelength of 405 nanometers. The ZEISS LSM 510 Meta can activate PA-GFP fusion proteins localized in discrete areas through the use of the Region of Interest (ROI) tool in the LSM software.